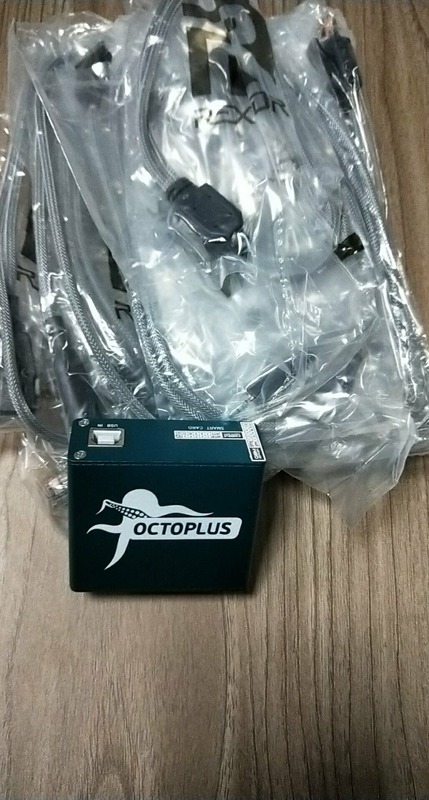 Octoplus box Octopus box+octoplus frp actived + Full activated for LG for Samsung +5cables including optimus cable	Octoplus Box allows you to perform Flash/Unlock/Repair operations with Samsung and LG cell phones. At the moment Octoplus is one of the most updatable and functional solutions available on the market. It features a wide range of service operations for most of Samsung and LG cell phones, has a multilingual software interface and lots of additional functions, available for various mobile operating systems. Supported operating systems: Windows 7/8/10 Octoplus Box – Main Features Unlock Repair IMEI/Bluetooth Write Firmware Read/Calculate Codes Read/Write Full Flash Read/Write GDFS Flash via USB Read/Write/Repair NVM Read/Write/Repair EEPROM Edit Language Format FS Write/Repair Security Write Security Backup Factory Reset Hard Reset Read/Write/Repair TA Read Info Repair EFS Repair WiFi Address Reset Screen Lock/Pattern Lock Dump RAM/NAND Octoplus Box – Supported Models: LG A-series: A100, A100a, A100GO, A110, A130, A133, A133CH, A133GO, A133R, A155, A160, A165, A170, A170GO, A175, A175a, A175b, A180, A180a, A180b, A190, A190a, A190b, A200, A225, A225GO, A230, A235, A250, A258, A270, A270E, A271, A275, A290, A310, A340, A341, A380, A390, A395, A399, A447, A7100, A7150 AS-series: AS323, AS330, AS870 B-series: B200, B200A, B200E, B2000, B2050, B2060, B2070, B2100, B2150, B220, B220A, B200, B200A, B200E, B525 BL-series: BL20, BL20cf, BL20df, BL20e, BL20GO, BL20t, BL20v, BL40, BL40e, BL40f, BL40g, BL42k C-series: C100, C105, C1100, C1150, C1200, C1300, C1300i, C1400, C1500, C193, C195, C195N, C197, C199, C205, C2200, C297, C299, C300, C300GO, C305, C310, C3100, C320, C320i, C330, C3300, C330i, C3310, C3320, C333, C3380, C3400, C360, C3600, C360GO, C365, C370, C375, C395, C397, C398, C399, C410, C440, C441, C550, C555, C660, C660h, C660R, C710, C710h, C729, C729DW, C729DWDU, C729DWP, C729TN, C800, C800DG, C800DGDU, C800DGP, C800g, C800TKGO, C800VL, C800VLP, C900, C900B, C900k CB-series: CB630 CE-series: CE110, CE500 CF-series: CF360, CF360GO, CF360GO1, CF750 CG-series: CG180, CG225 CT-series: CT810, CT815 CU-series: CU320, CU400, CU405, CU500, CU500V, CU515, CU575, CU720, CU915, CU920 D-series: D100, D100AR, D100F, D100G, D100J, D105, D105F, D107F, D120, D120AR, D120F, D120G, D120J, D125, D125F, D125G, D127F, D150, D150G, D157, D157F, D160, D160AR, D160F, D160G, D160GO, D160J, D160TR, D165, D165AR, D165F, D165G, D170, D175F, D180F, D213, D213AR, D213C, D213CF, D213CJ, D213F, D213K, D213N, D213TR, D221, D221C, D225, D227, D228, D280, D280AR, D280F, D280G, D280N, D280NR, D280TR, D285, D285F, D285G, D290, D290AR, D290G, D290J, D290N, D290TR, D295, D295F, D300f, D300g, D315, D315H, D315I, D315K, D315S, D320, D320AG, D320AR, D320F, D320F8, D320G8, D320J8, D320N, D320TR, D321, D325, D325F, D325F8, D325G8, D329, D331, D331TR, D335, D335E, D337, D370, D370TR, D373, D373EU, D375, D375AR, D380, D385, D390, D390AR, D390N, D390NS, D392, D392D, D392K, D393, D400, D400H, D400HN, D400N, D405, D405H, D405N, D405TR, D410, D410H, D410HN, D410N, D415, D415BK, D415RD, D415RDGO, D486, D500, D500BK, D500BKGO1, D505, D520, D520BK, D605, D610, D610AR, D610TR, D618, D620, D620FR, D620J, D620K, D620R, D625, D631, D680, D681, D682, D682TR, D683, D684, D685, D686, D690, D690N, D693, D693N, D693TR, D700, D722, D722AR, D722J, D722K, D722P, D722PA, D722V, D723, D723TR, D724, D725, D725P, D725PR, D725WP, D726, D727, D728, D729, D800, D800P, D800T, D801, D801BK, D801HW, D801WH, D801Z, D802, D802T, D802TA, D802TR, D803, D805, D806, D820, D820BK, D821, D830, D838, D850, D850PR, D850TR, D851, D851TN, D851WH , D852, D852G, D855, D855AR, D855K, D855P, D855TR, D855V, D856, D857, D858, D858HK, D859, D950, D950G, D950P, D950W, D951, D955, D956, D957, D958, D959, D959BK, D959TS DM-series: DM-01G E-series: E400, E400b, E400f, E400g, E400GO, E400r, E405, E405f, E410, E410b, E410C, E410f, E410g, E410i, E411f , E411g, E415, E415F, E415G, E420, E420F, E425, E425C, E425F, E425G, E425J, E430, E430GO, E431G, E435, E435F, E435G, E435K, E440, E440F, E440G, E440J, E445, E450, E450B, E450F, E450G, E450J, E451G, E455, E455F, E455G, E460, E460F, E465F, E465G, E467F, E470F, E475F, E510, E510f, E510g, E610, E610GO, E610v, E612, E612f, E612g, E615, E615f, E617G, E720, E720b, E720K, E730, E730f, E739, E739BK, E739BKDU, E739BKP, E739KW, E739KWDU, E739KWP, E900, E900h, E906, E960 (Nexus 4), E970, E970P, E971, E973, E975, E975G, E975K, E975R, E975T, E975W, E976, E977, E980, E980H, E980P, E981H, E985, E985T, E986, E987, E988, E989 F-series: F100S, F1200, F120K, F120L, F120S, F160K, F160L, F160LV, F160S, F180K, F180L, F180S, F200K, F200L, F200LS, F200S, F2100, F220DS, F220DSK, F220K, F220L, F220S, F2300, F2400, F240K, F240L, F240S, F2410, F3000, F300K, F300L, F300S, F310L, F310LR, F320K, F320L, F320S, F340K, F340L, F340S, F350K, F350L, F350S, F370K, F370L, F370S, F400K, F400L, F400S, F410S, FK430F, F430K, F430L, F430S, F440L, F460K, F460L, F460S, F470K, F470L, F470S, F480K, F480L, F480S, F500K, F500L, F500S, F510K, F510L, F510S, F520K, F520L, F520S, F540K, F540L, F540S, F560K, F570S, F600K, F600L, F600S, F610K, F610L, F610S, F620K, F620L, F620S, F650K, F650L, F650S, F670K, F670L, F670S, F700K, F700L, F700S, F7100, F720K, F720L, F720S, F750K, F800K, F800L G-series: G1600, G1610, G1800, G3000, G3100, G350, G360, G4010, G4015, G4050, G420, G5300, G5300i, G5400, G5500, G5600, G7000, G7030, G7050, G7100, G7110, G7120 GB-series: GB100, GB101, GB102, GB102GO, GB105, GB106, GB107, GB108, GB109, GB110, GB115, GB125, GB125a, GB125R, GB126, GB130, GB160, GB160a, GB160b, GB161, GB165, GB170, GB175, GB190, GB190a, GB190b, GB195, GB210, GB220, GB220GO, GB220NGO, GB230, GB250, GB250f, GB250g, GB255, GB255B, GB255G, GB258, GB280 GC-series: GC900, GC900e, GC900f GD-series: GD310, GD330, GD335, GD350, GD510, GD510GO, GD510N, GD510NGO, GD550, GD550e, GD570, GD570AQ, GD570AV, GD570AW, GD580, GD710, GD880, GD880f, GD880G, GD900, GD900e, GD900f, GD910, GD910c GM-series: GM200, GM205, GM205GO, GM210, GM310, GM310F, GM310G, GM360, GM360GO, GM360i, GM600, GM630, GM730, GM730e, GM730f, GM735, GM750, GM750h, GM750n, GM750Q GR-series: GR500, GR500F, GR500FD, GR500FGO, GR500R, GR500W, GR501, GR525g, GR700, GR700P GS-series: GS100, GS101, GS101a, GS101GO, GS102, GS105, GS105GO, GS106, GS106a, GS107, GS107a, GS107b, GS108, GS117, GS155, GS155a, GS155b, GS170, GS190, GS200, GS205, GS290, GS290GO, GS290N, GS290NGO, GS390, GS390GO, GS500, GS500f, GS500g, GS500GO, GS500GX, GS500v, GS505 GT-series: GT350, GT350F, GT350GO, GT350i, GT360, GT365, GT370, GT400, GT400GO, GT405, GT500, GT500N, GT500s, GT505, GT505e, GT540, GT540f, GT540G, GT540GO, GT540R, GT550, GT810, GT810h, GT950 GU-series: GU200, GU200a, GU200b, GU200e, GU220, GU230, GU230GO, GU280, GU280f, GU282, GU285, GU285f, GU285g, GU290f, GU290fPO, GU292, GU292A, GU295, GU295F, GU295g, GU297, GU297a, GU920V GW-series: GW300, GW300FD, GW300GO, GW305, GW330GO, GW370, GW370b, GW382f, GW520, GW520GO, GW525, GW550, GW550h, GW620, GW620F, GW620G, GW620GO, GW620R, GW820, GW825, GW825v GX-series: GX200, GX300, GX500 H-series: H220, H221, H221AR, H221F, H221G, H222, H222F, H222G, H222TTV, H222TV, H320, H320AR, H320MB, H324, H324T, H324TR, H326G, H326T, H326TV, H340, H340AR, H340F, H340G, H340H, H340N, H340Y, H342, H342F, H342FT, H342TR, H342I, H343, H345, H410, H410YK, H420, H420F, H422, H422F, H422T, H422TV, H440, H440AR, H440F, H440N, H440V, H440Y, H442, H442F, H443, H445, H500, H500F, H500G, H500T, H500TR, H502, H502F, H502G, H502T, H502TV, H502Y, H520, H520F, H520G, H520Y, H522, H522F, H522Y, H525, H525N, H525TR, H540, H540D, H540F, H540T, H542, H542TR, H630, H630D, H630I, H631, H634, H635, H635A, H635AR, H635C, H635CX, H636, H650, H650AR, H650E, H650K, H731, H734, H735, H735AR, H735L, H735MT, H735P, H735T, H735TR, H736, H736P, H740, H778, H779, H788, H788N, H788SG, H788TR, H790, H790T, H791, H791F, H810, H810PR, H810VK, H811, H811VK H812, H815, H815AR, H815K, H815L, H815P, H815T, H815TR, H818, H818N, H818P, H818PA, H819, H820, H820PR, H830, H830SV, H831, H840, H840AR, H840TR, H845, H845N, H848, H850, H850AR, H850K, H850TR, H858, H860, H860N, H868, H870, H870AR, H870I, H870DS, H870DSU, H870K, H870S, H870U, H870V, H872, H900, H900PR, H901, H910, H915, H918, H932, H932U, H950, H950PR, H955, H955A, H955AR, H955HK, H955P, H955TR, H959, H960, H960A, H960AR, H960ATR, H960AY, H960P, H960TR, H960YK, H961, H961AN, H961N, H961S, H962, H968, H970, H990, H990DS, H990N, H990T HB-series: HB620, HB620T K-series: K100, K100DS, K100E, K100TR, K120, K120AR, K120E, K120F, K120GT, K120H, K121, K130, K130E, K130F, K130Y, K200, K200DS, K200DSF, K200DSK, K200F, K200MT, K210, K220, K220AR, K220BR, K220DSF, K220DSZ, K220H, K220T, K220Y, K220Z, K240, K240AR, K240F, K240H, K330, K350, K350AR, K350DS, K350E, K350F, K350H, K350K, K350N, K350NDS, K350TR, K350Y, K350Z, K371, K373, K410, K410A, K410F, K410G, K420DS, K420N, K420NM, K420PR, K425, K428, K430AR, K430DS, K430DSE, K430DSF, K430DSY, K430H, K430N, K430T, K430TR, K430TV, K430Y, K450, K500AR, K500DS, K500DSF, K500DSK, K500DSZ, K500F, K500H, K500I, K500J, K500K, K500N, K500TR, K500Y, K500Z, K520, K520D, K520DY, K520K, K520TR, K520Y, K530, K530AR, K530DY, K530F, K530TR, K535, K535D, K535N, K535T, K540, K550, K550BN, K550BNGO1, K557, K580, K580AR, K580DS, K580DSF, K580DSK, K580DSZ, K580F, K580H, K580I, K580TR, K580Y, K580Z, K600, K600HK, K600Y KB-series: KB620, KB770, KB775f KC-series: KC550, KC560, KC910, KC910Q, KC910Qa KE-series: KE500, KE508, KE590, KE590i, KE600, KE608, KE770, KE800, KE850, KE850A, KE858, KE970, KE990, KE990C, KE990d, KE998 KF-series: KF240, KF245, KF300, KF305, KF310, KF311, KF350, KF390, KF390GO, KF390Q, KF510, KF600, KF690, KF700, KF700q, KF701, KF750, KF750GO, KF755, KF755c, KF755d, KF757, KF758, KF900 KG-series: KG110, KG115, KG118, KG119, KG120, KG130, KG190, KG195, KG200, KG210, KG220, KG221, KG225, KG228, KG240, KG245, KG270, KG271, KG275, KG276, KG278, KG280, KG285, KG288, KG289, KG290, KG291, KG296, KG300, KG320, KG320s, KG328, KG370, KG375, KG376, KG70, KG77, KG800, KG810, KG90, KG90n KH-series: KH1000, KH1200, KH1300, KH1400, KH1600, KH1800, KH1800M, KH2100, KH2200, KH2700, KH3100, KH3400, KH3900, KH4500, KH5200, KH6400, KH6500, KH8000, KH8200, KH8600 KM-series: KM330, KM335, KM380, KM380c, KM380d, KM380T, KM385d, KM386c, KM500, KM500c, KM500d, KM501, KM553, KM555, KM555e, KM555G, KM555GO, KM555R, KM555RGO, KM570, KM570F, KM710, KM710C, KM710D, KM900, KM900e, KM900f, KM900g KP-series: KP100, KP105, KP106, KP107, KP108, KP109, KP109a, KP109b, KP110, KP115, KP130, KP130a, KP130b, KP135, KP150, KP151, KP152, KP168, KP169, KP170, KP175, KP199, KP200, KP202, KP202i, KP210, KP215, KP220, KP230, KP233, KP235, KP260, KP265, KP270, KP275, KP293, KP320, KP330, KP500, KP501, KP501GO, KP501N, KP502, KP502GO, KP505, KP550, KP570, KP570q KS-series: KS20, KS360, KS365, KS500, KS660 KT-series: KT520, KT525, KT610, KT615 KU-series: KU1700, KU2000, KU2100, KU250, KU2800, KU310, KU311, KU3700, KU380, KU385, KU4000, KU4300, KU450, KU5400, KU580, KU5900, KU6000, KU6300, KU800, KU830, KU9000, KU9100, KU9200, KU9300, KU950, KU9500, KU9600, KU970, KU990, KU990GO, KU990i, KU990iGO, KU990MF, KU990R L-series: L01A, L01B, L01C, L01F, L02B, L03A, L03B, L03C, L04A, L04B, L04C, L06A, L07C, L1100, L1150, L1400, L21, L22, L23 , L24, L25, L3100, L341i, L342i, L343i, L600i, L600v, L601i, L602i, L704i, L705i, L705ix, L706ie, L852i L-0-series: L-01D, L-01E, L-02D, L-02E, L-04E, L-05D, L-05E, L-06C, L-06D, L-06DJOJO, L-06DJOJOP, L-07C LG-series: LG870 LS-series: LS450, LS660, LS665, LS675, LS676, LS720, LS740, LS751, LS755, LS770, LS775, LS885, LS970, LS980, LS990, LS991, LS992, LS993, LS995, LS996 LU-series: LU6200 LV-series: LV7400, LV7400R M-series: M150, M151, M153, M210, M250, M250AR, M250E, M250F, M250H, M250N, M250Y, M250YK, M250I, M250K, M250M, M250DS, M250DSN, M257, M257PR, M322, M400AR, M400DF, M400DK, M400DY, M400F, M400MT, M400N, M400Y, M430, M4400, M4410, M470, M470F, M6100, M700, M700A, M700AN, M700AR, M700B, M700DSK, M700DSN, M700F, M700H, M700N, M700TV, M700Y, M700Z, M703, M703PR, M710H, ME-series: ME550, ME770, ME850, ME850c, ME850d, ME970, ME970c, ME970d MG-series: MG100, MG101, MG105, MG110b, MG120, MG125, MG130, MG150, MG155, MG160, MG161, MG161a, MG165, MG165a, MG230d, MG235, MG280, MG295, MG296, MG320, MG370, MG377, MG610, MG800, MG808, MG810c, MG810d MP-series: MP260, MP450 MS-series: MS20, MS210, MS25, MS323, MS330, MS345, MS395, MS428, MS500, MS500Z , MS550, MS631, MS659, MS769, MS870 MU-series: MU500, MU515 P-series: P350, P350F, P350G, P350GN, P350GO, P355, P500, P500GO, P500H, P503, P504, P505 , P505CH, P505P, P505R, P506, P506GO, P509, P509BK, P509BKP, P509MZ, P509MZDU, P509MZP, P509P, P509TN, P509TNDU, P509TNP, P520, P655H, P655K, P659, P659BK, P659BKGO, P659H, P690, P690b, P690F, P692, P693, P698, P698f, P700, P705, P705f, P705g, P705GO, P708g, P710, P712, P713, P713GO, P713TR, P714, P715, P716, P720, P7200, P720h, P725, P760, P765, P768, P768e, P768f, P768g, P768N, P769, P769BK, P769BKGO, P769BKGO1, P778G, P870, P870H, P870P, P875, P875H, P880, P880g, P895, P895QB, P920, P920H, P925, P925G, P925P, P929, P930, P930P, P935, P936, P940, P940h, P940SC, P970, P970G, P970H, P970N, P990, P990DW, P990H, P990HN, P993, P999, P999DW, P999DWDU, P999DWP, P999WA RS-series: RS988 S-series: S01, S02, S310, S360, S365, S367, S5000, S5100, S5200 SH-series: SH110, SH130, SH150, SH150A, SH170, SH210, SH240, SH400, SH410, SH460, SH470, SH490, SH640, SH650, SH810, SH860 SU-series: SU100, SU130, SU200, SU210, SU370, SU410, SU420, SU430, SU540, SU600, SU630, SU640, SU660, SU760, SU870, SU880, SU900, SU910, SU920, SU950, SU960 T-series: T300, T310, T310GO, T310i, T310N, T315i, T320, T320e, T320g, T325, T325G, T370, T375, T385, T385B, T385GO, T395, T480K, T480S, T500, T500GO, T505, T505GO, T510, T515, T515DW, T530, T565, T565B, T580, T585 TE-series: TE365, TE365F TG-series: TG800 TP-series: TP260, TP450 TU-series: TU330, TU500, TU515, TU515T, TU720, TU750, TU915 U-series: U250, U300, U300C, U310, U310C, U370, U370c, U370w, U450, U450C, U800, U8120, U8130, U8150, U8180, U8200, U8210, U8290, U830, U8330, U8360, U8380, U880, U890, U900, U960, U960, U970, U990 UK-series: UK410 US-series: US610, US992, US996 V-series: V32, V33, V400, V410, V411, V490, V495, V496, V497, V520, V521, V521WG, V522, V525, V530, V909, V909DW, V909DWDU, V930, V935, V935T, V940, V940N VK-series: VK410, VK815 VM-series: VM720 VS-series: VS425, VS500, VS500PP VS750, VS810KPP, VS810PP, VS870, VS880PP, VS930, VS980, VS985, VS985DU, VS985WDU, VS986, VS986W, VS987, VS990, VS995 W-series: W3000, W5300, W7000, W7020, W7100 X-series: X130G, X130J, X135, X137, X145, X147, X150, X155, X157, X160, X165, X165G, X170, X170FTV, X170G, X180G, X190, X210, X210DS, X210G, X210MA, X210MB, X220DS, X220DSH, X220DST, X220G, X220M, X220MB, X230, X230AR, X230DS, X230DSF, X230F, X230H, X230HV, X230K, X230YK, X230Z, X240AR, X240DS, X240DSF, X240F, X240H, X240I, X240K SAMSUNG Galaxy S-series: Galaxy S SC-02B Galaxy Tab-series: Galaxy Tab SC-01C G-series: G9500, G9508, G950D, G950F, G950FD, G950J, G950N, G950U, G950U1, G950V, G950W GT-5-series: GT-5570, GT-5570B, GT-5570L GT-B-series: GT-B2710, GT-B2710D, GT-B3210, GT-B3210M, GT-B3310, GT-B3313, GT-B3410, GT-B3410L, GT-B3410W, GT-B5330, GT-B5330B, GT-B5330L, GT-B5510, GT-B5510B, GT-B5510L, GT-B5512, GT-B5512B, GT-B7510, GT-B7510L, GT-B7722 GT-C-series: GT-C3010, GT-C3010S, GT-C3011, GT-C3050, GT-C3050C, GT-C3200, GT-C3200G, GT-C3212, GT-C3212I , GT-C3222, GT-C3222W, GT-C3262, GT-C3300, GT-C3300D, GT-C3300I, GT-C3300K, GT-C3303, GT-C3303I, GT-C3303K, GT-C3310, GT-C3310R, GT-C3312, GT-C3312R, GT-C3312S, GT-C3313T, GT-C3322, GT-C3322i, GT-C3322W, GT-C3330, GT-C3332, GT-C3350, GT-C3500, GT-C3510, GT-C3510N, GT-C3510T, GT-C3520, GT-C3530, GT-C3560, GT-C3590, GT-C3592, GT-C3595, GT-C3750, GT-C3752, GT-C3780, GT-C3782, GT-C5010, GT-C5010B, GT-C5010E, GT-C5212I, GT-C5510, GT-C6112, GT-C6112C, GT-C6712 GT-E-series: GT-E1050, GT-E1050I, GT-E1050V , GT-E1055G, GT-E1055T, GT-E1070, GT-E1070C, GT-E1070M, GT-E1070T, GT-E1080, GT-E1080C, GT-E1080F, GT-E1080I, GT-E1080T, GT-E1080W, GT-E1081T, GT-E1085F, GT-E1085L, GT-E1086, GT-E1086I, GT-E1086L, GT-E1087T, GT-E1088C, GT-E1100T, GT-E1105F, GT-E1105T, GT-E1120 , GT-E1130B, GT-E1150, GT-E1150C, GT-E1150I, GT-E1151, GT-E1153, GT-E1153I, GT-E1155L, GT-E1170, GT-E1170I, GT-E1170T, GT-E1175T, GT-E1190, GT-E1195, GT-E1200, GT-E1200I, GT-E1200M, GT-E1200R, GT-E1200T, GT-E1200Y, GT-E1202, GT-E1202C, GT-E1202I, GT-E1205L, GT-E1205M, GT-E1205Q, GT-E1205T, GT-E1205Y, GT-E1207T, GT-E1207Y, GT-E1210, GT-E1210S, GT-E1220, GT-E1220T, GT-E1225T, GT-E123, GT-E1230, GT-E1230T, GT-E1232B, GT-E1232D, GT-E1260, GT-E1260B, GT-E1270, GT-E1272, GT-E1272I, GT-E1280, GT-E1282T, GT-E1310, GT-E1310B, GT-E1310C, GT-E1310E, GT-E1310M, GT-E1310S, GT-E1360, GT-E1360B, GT-E1360M, GT-E1360S, GT-E1500, GT-E210, GT-E2120, GT-E2120B, GT-E2120L, GT-E2121, GT-E2121B, GT-E2121L, GT-E2152, GT-E2152I, GT-E2152L, GT-E2200, GT-E2202, GT-E2210 , GT-E2210B , GT-E2210C, GT-E2210L, GT-E2220, GT-E2222, GT-E2230, GT-E2230L, GT-E2230M, GT-E2232, GT-E2250, GT-E2252, GT-E2262, GT-E2330, GT-E2330B, GT-E2350, GT-E2350B, GT-E2370, GT-E2530, GT-E2550, GT-E2600, GT-E2652, GT-E2652W, GT-E3210, GT-E3213K, GT-E3217L, GT-E3300, GT-E3300I, GT-E3300L, GT-E3309 GT-I-series: GT-I5500, GT-I5500B, GT-I5500L, GT-I5500M, GT-I5503, GT-I5503T, GT-I5508, GT-I5510, GT-I5510L, GT-I5510M, GT-I5510T, GT-I5700, GT-I5700E, GT-I5700L, GT-I5800, GT-I5800L, GT-I5801, GT-I6712, GT-I7500L, GT-I8150, GT-I8150B, GT-I8150T, GT-I8160, GT-I8160L, GT-I8160P, GT-I8190, GT-I8190L, GT-I8190N, GT-I8190T, GT-I8200, GT-I8200L, GT-I8200N, GT-I8200Q, GT-I8260, GT-I8260B, GT-I8260E, GT-I8260L, GT-I8262, GT-I8262B, GT-I8262D, GT-I8262E, GT-I8262L, GT-I8320, GT-I8350, GT-I8350T, GT-I8530, GT-I8530C, GT-I8550, GT-I8550E, GT-I8550L, GT-I8552, GT-I8552B, GT-I8730, GT-I8730T, GT-I8750, GT-I9000, GT-I9000B, GT-I9000M, GT-I9000T, GT-I9001, GT-I9003, GT-I9003L, GT-I9010, GT-I9020, GT-I9020A, GT-I9020T, GT-I9023, GT-I9060, GT-I9060C, GT-I9060I, GT-I9060L, GT-I9060M, GT-I9063T, GT-I9070, GT-I9070C, GT-I9070H, GT-I9070P, GT-I9080, GT-I9080L, GT-I9082, GT-I9082L, GT-I9100, GT-I9100G, GT-I9100M, GT-I9100P, GT-I9100T, GT-I9103, GT-I9105, GT-I9105P, GT-I9108, GT-I9128V, GT-I9150, GT-I9152, GT-I9190, GT-I9192, GT-I9195, GT-I9195I, GT-I9195L, GT-I9195T, GT-I9197, GT-I9198, GT-I9200, GT-I9205, GT-I9206, GT-I9207, GT-I9208, GT-I9210, GT-I9210T, GT-I9250, GT-I9250M, GT-I9250T, GT-I9260, GT-I9268, GT-I9295, GT-I9300, GT-I9300C, GT-I9300I, GT-I9300T, GT-I9301i, GT-I9305, GT-I9305N, GT-I9305T, GT-I9308, GT-I9308I, GT-I9500, GT-I9502, GT-I9505, GT-I9506, GT-I9515, GT-I9515L, GT-II8200Q GT-N-series: GT-N5100, GT-N5105, GT-N5110, GT-N7000, GT-N7000B, GT-N7005, GT-N7100, GT-N7100T, GT-N7102, GT-N7105, GT-N7105T, GT-N7108, GT-N8000, GT-N8005, GT-N8010, GT-N8013 GT-P-series: GT-P1000, GT-P1000L, GT-P1000M, GT-P1000N, GT-P1000R, GT-P1000T, GT-P1010, GT-P3100, GT-P3100B, GT-P3110, GT-P3113, GT-P5100, GT-P5110, GT-P5113, GT-P5200, GT-P5210, GT-P5220, GT-P6201, GT-P6800, GT-P6810, GT-P7300, GT-P7300B, GT-P7300C, GT-P7310, GT-P7510 GT-S-series: GT-S3330, GT-S3332, GT-S3350, GT-S3353, GT-S3370, GT-S3370B, GT-S3370L, GT-S3370Y, GT-S3550, GT-S3550L, GT-S3570, GT-S3572, GT-S3650, GT-S3650C, GT-S3650M, GT-S3650W, GT-S3653, GT-S3653M, GT-S3653W, GT-S3770, GT-S3770K, GT-S3770M, GT-S3800W, GT-S3802, GT-S3802W, GT-S3850, GT-S5220, GT-S5220R, GT-S5222, GT-S5229, GT-S5230, GT-S5230G, GT-S5230H, GT-S5230K, GT-S5230N, GT-S5230W, GT-S5233A, GT-S5233S, GT-S5233T, GT-S5233W, GT-S5250, GT-S5250L, GT-S5250W, GT-S5253, GT-S5260, GT-S5260L, GT-S5260P, GT-S5263, GT-S5270K, GT-S5270L, GT-S5270Y, GT-S5280, GT-S5282, GT-S5292, GT-S5296, GT-S5300, GT-S5300B, GT-S5300L, GT-S5301, GT-S5301B, GT-S5301L, GT-S5302, GT-S5302B, GT-S5303, GT-S5310, GT-S5310B, GT-S5310E, GT-S5310G, GT-S5310L, GT-S5310R, GT-S5310U, GT-S5312, GT-S5312L, GT-S5330, GT-S5333, GT-S5360, GT-S5360B, GT-S5360L, GT-S5360T, GT-S5363, GT-S5367, GT-S5369, GT-S5380, GT-S5380B, GT-S5380D, GT-S5380F, GT-S5380G, GT-S5380K, GT-S5510 , GT-S5510T , GT-S5511, GT-S5560I, GT-S5570, GT-S5570B, GT-S5570I, GT-S5570L, GT-S5578, GT-S5600, GT-S5600H, GT-S5600L, GT-S5603, GT-S5603T, GT-S5610, GT-S5610K, GT-S5611, GT-S5611V, GT-S5620, GT-S5620B, GT-S5620L, GT-S5620P, GT-S5620R, GT-S5628, GT-S5628I, GT-S5660, GT-S5660L, GT-S5660M, GT-S5660V, GT-S5670, GT-S5670B, GT-S5670L, GT-S5690, GT-S5690L, GT-S5690M, GT-S5690R, GT-S5750, GT-S5750E, GT-S5753, GT-S5753E, GT-S5780, GT-S5830, GT-S58301, GT-S5830B, GT-S5830C, GT-S5830D, GT-S5830G, GT-S5830I, GT-S5830L, GT-S5830M, GT-S5830T, GT-S5830V, GT-S5830Z, GT-S5838, GT-S5839I, GT-S6010, GT-S6010L, GT-S6010W, GT-S6012, GT-S6102, GT-S6102B, GT-S6102E, GT-S6102Z, GT-S6310, GT-S6310L, GT-S6310N, GT-S6310T, GT-S6312, GT-S6352, GT-S6500, GT-S6500D, GT-S6500L, GT-S6500T, GT-S6790, GT-S6790E, GT-S6790L, GT-S6790N, GT-S6792L, GT-S6800, GT-S6802, GT-S6802B, GT-S6810, GT-S6810B, GT-S6810E, GT-S6810L, GT-S6810M, GT-S6810P, GT-S6812, GT-S6812B, GT-S6812C, GT-S6812I, GT-S7070, GT-S7070C, GT-S7230E, GT-S7233E, GT-S7250, GT-S7250D, GT-S7262, GT-S7270, GT-S7270L, GT-S7272, GT-S7272C, GT-S7273T, GT-S7275, GT-S7275B, GT-S7275R, GT-S7275T, GT-S7275Y, GT-S7390, GT-S7390E, GT-S7390G, GT-S7390L, GT-S7392, GT-S7392L, GT-S7500, GT-S7500L, GT-S7500T, GT-S7508, GT-S7530, GT-S7560, GT-S7560M, GT-S7562, GT-S7562I, GT-S7562L, GT-S7572, GT-S7580, GT-S7580L, GT-S7582, GT-S7582L, GT-S7583T, GT-S7710, GT-S7710L, GT-S8000, GT-S8000B, GT-S8000C, GT-S8000H, GT-S8000L, GT-S8000M, GT-S8003, GT-S8500, GT-S8500B, GT-S8500L, GT-S8500M, GT-S8530, GT-S8530B, GT-S8530C, GT-S8530L, GT-S8600 GT-T-series: GT-T989, GT-T989D J-series: J530F, J530FM, J530G, J530GM, J530K, J530L, J530Y, J530YM, J700T, J700T1, J730F, J730FM, J730G, J730GM, J730K N-series: N9500, N9508, N950F, N950FD, N950N, N950U, N950U1, N950W SC-0-series: SC-01D, SC-01E, SC-01F, SC-01G, SC-01K, SC-02C, SC-02E, SC-02F, SC-03D, SC-03E, SC-04E, SC-04F, SC-04G, SC-05D, SC-05G, SC-06D SCV-series: SCV37 SCH-I-series: SCH-I435, SCH-I535, SCH-I997 SCH-M-series: SCH-M490, SCH-M710, SCH-M715 SCH-N-series: SCH-N719 SCH-R-series: SCH-R960 SCH-W-series: SCH-W200, SCH-W210, SCH-W240, SCH-W270, SCH-W290, SCH-W300, SCH-W330, SCH-W350, SCH-W360, SCH-W380, SCH-W390, SCH-W390M, SCH-W410, SCH-W420, SCH-W450, SCH-W460, SCH-W460R, SCH-W510, SCH-W550, SCH-W560, SCH-W570, SCH-W580, SCH-W590, SCH-W690, SCH-W720, SCH-W740, SCH-W750, SCH-W760, SCH-W770, SCH-W830, SCH-W850, SCH-W860, SCH-W900, SCH-W920, SCH-W930 SCL-series: SCL24 SGH-A-series: SGH-A157, SGH-A177, SGH-A257, SGH-A517 , SGH-A667, SGH-A667T, SGH-A767, SGH-A777, SGH-A817, SGH-A847, SGH-A847D, SGH-A847M, SGH-A847R, SGH-A877, SGH-A887, SGH-A927, SGH-A997 SGH-B-series: SGH-B2100 SGH-C-series: SGH-C414, SGH-C414M, SGH-C414R, SGH-C414V, SGH-C414W, SGH-C414Y SGH-I-series: SGH-I187, SGH-I257, SGH-I257M, SGH-I317, SGH-I317M, SGH-I337, SGH-I337M, SGH-I337Z, SGH-I407, SGH-I437, SGH-I437P, SGH-I437Z, SGH-I497, SGH-I527, SGH-I527M, SGH-I537, SGH-I545, SGH-I547, SGH-I547C, SGH-I577, SGH-I667L, SGH-I677, SGH-I677L, SGH-I677T, SGH-I717, SGH-I717D, SGH-I717M, SGH-I717R, SGH-I727, SGH-I727R, SGH-I747, SGH-I747D, SGH-I747M, SGH-I757M, SGH-I777, SGH-I827, SGH-I827D, SGH-I847, SGH-I8700, SGH-I897, SGH-I917, SGH-I917R, SGH-I937, SGH-I957, SGH-I957D, SGH-I957M, SGH-I957R, SGH-I997R SGH-M-series: SGH-M919, SGH-M919M, SGH-M919V SGH-S-series: SGH-S275M, SGH-S275R, SGH-S730M SGH-T-series: SGH-T159V, SGH-T199, SGH-T259, SGH-T289, SGH-T359, SGH-T379, SGH-T399, SGH-T399N, SGH-T469, SGH-T469V, SGH-T469W, SGH-T479, SGH-T479B, SGH-T499, SGH-T499V, SGH-T499Y, SGH-T589, SGH-T589R, SGH-T589W, SGH-T599, SGH-T599N, SGH-T599V, SGH-T669, SGH-T679, SGH-T679M, SGH-T699, SGH-T759, SGH-T769, SGH-T839, SGH-T879, SGH-T889, SGH-T889V, SGH-T899, SGH-T899M, SGH-T939, SGH-T959, SGH-T959P, SGH-T959v, SGH-T989, SGH-T989D, SGH-T999, SGH-T999L, SGH-T999N, SGH-T999V SHV-E-series: SHV-E110S, SHV-E120K, SHV-E120L, SHV-E120S, SHV-E140S, SHV-E150S, SHV-E160K, SHV-E160L, SHV-E160S, SHV-E170K, SHV-E170L, SHV-E170S, SHV-E210K, SHV-E210L, SHV-E210S, SHV-E250K, SHV-E250S, SHV-E270K, SHV-E270S, SHV-E275S, SHV-E300K, SHV-E300L, SHV-E300S, SHV-E330K , SHV-E330L, SHV-E330S , SHV-E370K, SHV-E470S, SHV-E500L, SHV-E500S SHW-A-series: SHW-A110K, SHW-A110S, SHW-A130S, SHW-A160S, SHW-A180S, SHW-A210S, SHW-A220S, SHW-A250K, SHW-A250S, SHW-A300S SHW-M-series: SHW-M100S, SHW-M110S, SHW-M130K, SHW-M180S, SHW-M190S, SHW-M240S, SHW-M250K, SHW-M250S, SHW-M250S, SHW-M290K, SHW-M340S, SHW-M440, SHW-M440S SM-A-series: SM-A3000, SM-A3009, SM-A300F, SM-A300FU, SM-A300G, SM-A300H, SM-A300M, SM-A300Y, SM-A300YZ, SM-A310F, SM-A310FD, SM-A310M, SM-A310MD, SM-A310N0, SM-A310Y, SM-A320F, SM-A320FL, SM-A320Y, SM-A5000, SM-A500F, SM-A500F1, SM-A500FD, SM-A500FQ, SM-A500FU, SM-A500G, SM-A500H, SM-A500HQ, SM-A500K, SM-A500L, SM-A500M, SM-A500S, SM-A500W, SM-A500XZ, SM-A500Y, SM-A500YZ, SM-A5100, SM-A5108, SM-A510F, SM-A510FD, SM-A510K, SM-A510L, SM-A510M, SM-A510MD, SM-A510S, SM-A510Y, SM-A510YD, SM-A520F, SM-A520K, SM-A520L, SM-A520S, SM-A520W, A530F, A530N, A530W, SM-A7000, SM-A7009, SM-A700F, SM-A700FD, SM-A700FQ, SM-A700FZ, SM-A700H, SM-A700K, SM-A700L, SM-A700M, SM-A700S, SM-A700YD, SM-A700YZ, SM-A7100, SM-A7108, SM-A710F, SM-A710FD, SM-A710K, SM-A710L, SM-A710M, SM-A710MD, SM-A710S, SM-A710Y, SM-A720F, A730F, A730N, SM-A800F, SM-A800I, SM-A800IZ, SM-A800S, SM-A800YZ, SM-A9000, SM-A9000K, SM-A9100, SM-A910F, SM-A910FD SM-B-series: SM-B105E, SM-B109E, SM-B110E, SM-B310E, SM-B312E , SM-B312EH, SM-B313E, SM-B350E, SM-B360E SM-C-series: SM-C101, SM-C105, SM-C105A, SM-C105K, SM-C105L, SM-C105S, SM-C111, SM-C115, SM-C115M, SM-C5000, SM-C5010, SM-C7000, SM-C700S, SM-C7010, SM-C9000, SM-C900F, SM-C900Y SM-E-series: SM-E500F, SM-E500H, SM-E500HQ, SM-E500M, SM-E500YZ, SM-E7000, SM-E700F, SM-E700H, SM-E700M SM-G-series: SM-G110B, SM-G110H, SM-G110M, SM-G130BT, SM-G130BU, SM-G130E, SM-G130H , SM-G130HN , SM-G130M, SM-G130U, SM-G150N0, SM-G150NK, SM-G150NL, SM-G150NS, SM-G155S, SM-G1600, SM-G310HN, SM-G313H, SM-G313HN, SM-G313HU, SM-G313HY, SM-G313HZ, SM-G313M, SM-G313ML, SM-G313MU, SM-G313MY, SM-G313U, SM-G316H, SM-G316HU, SM-G316M, SM-G316ML, SM-G316MY, SM-G316U, SM-G318H, SM-G318HZ, SM-G318ML, SM-G318MZ, SM-G350, SM-G350E, SM-G350L, SM-G350M, SM-G355H, SM-G355HN, SM-G355HQ, SM-G355M, SM-G357F, SM-G357FZ, SM-G357M, SM-G3606, SM-G3608, SM-G3609, SM-G360AZ, SM-G360BT, SM-G360F, SM-G360FY, SM-G360G, SM-G360GY, SM-G360H, SM-G360HU, SM-G360M, SM-G360P, SM-G360T, SM-G360T1, SM-G361F, SM-G361H, SM-G361HU, SM-G3812, SM-G3812B, SM-G3815, SM-G3818, SM-G3819, SM-G386F, SM-G386W, SM-G388F, SM-G389F, SM-G390F, SM-G390W, SM-G390Y, SM-G5108, SM-G5108Q, SM-G5109, SM-G5308W, SM-G5309W, SM-G530A, SM-G530BT, SM-G530F, SM-G530FQ, SM-G530FZ, SM-G530H, SM-G530M, SM-G530P, SM-G530T, SM-G530T1, SM-G530Y, SM-G531BT, SM-G531F, SM-G531H, SM-G531Y, SM-G532F, SM-G532FD, SM-G532G, SM-G532M, SM-G532MT, SM-G5500, SM-G550F, SM-G550FY, SM-G550T, SM-G550T2, SM-G5510, SM-G5700, SM-G570F, SM-G570FD, SM-G570M, SM-G570MD, SM-G570Y, SM-G6000, SM-G600F, SM-G600FY, SM-G600S, SM-G6100, SM-G610F, SM-G610FD, SM-G610FZ, SM-G610M, SM-G610L, SM-G610K, SM-G610S, SM-G610Y, SM-G710, SM-G7102 , SM-G7102T, SM-G7105, SM-J7108, SM-G7105L, SM-J710F, SM-J710FQ, SM-J710FZ, SM-J710FD, SM-J710FN, SM-J710GN, SM-G710K, SM-G710L, SM-J710MN, SM-G710S, SM-G7200, SM-G7202, SM-G720AX, SM-G720NO, SM-G730A, SM-G730M, SM-G730W8, SM-G7508Q, SM-G7509, SM-G750A, SM-G750F, SM-G750H, SM-G800F, SM-G800H, SM-G800HQ, SM-G800I, SM-G800M, SM-G800Y, SM-G850A, SM-G850F, SM-G850FQ, SM-G850M, SM-G850T, SM-G850Y, SM-G860P, SM-G870A, SM-G870D, SM-G870F, SM-G870F0, SM-G870W, SM-G890A, SM-G891A, SM-G892U, SM-G9006V, SM-G9006W, SM-G9008V, SM-G9008W, SM-G9009D, SM-G9009W, SM-G900A, SM-G900F, SM-G900FD, SM-G900FG, SM-G900H, SM-G900I, SM-G900K, SM-G900L, SM-G900M, SM-G900MD, SM-G900P , SM-G900S, SM-G900T, SM-G900T2, SM-G900T3, SM-G900W8, SM-G901F, SM-G903F, SM-G903FD, SM-G903M, SM-G903W, SM-G906K, SM-G906L, SM-G906S, SM-G9105, SM-G910S, SM-G9200, SM-G9208, SM-G9209, SM-G920A, SM-G920AZ, SM-G920D, SM-G920F, SM-G920FD, SM-G920FZ, SM-G920I, SM-G920K, SM-G920L, SM-G920P, SM-G920R4, SM-G920S, SM-G920T, SM-G920W8, SM-G9250, SM-G925A, SM-G925F, SM-G925FQ, SM-G925I, SM-G925K, SM-G925L, SM-G925P, SM-G925S, SM-G925T, SM-G925W8, SM-G9287, SM-G9287C, SM-G928C, SM-G928F, SM-G928G, SM-G928I, SM-G928K, SM-G928L, SM-G928N0, SM-G928P, SM-G928S, SM-G928T, SM-G928W8, SM-G9300, SM-G9308, SM-G930F, SM-G930FD, SM-G930K, SM-G930L, SM-G930P, SM-G930S, SM-G930T, SM-G930U, SM-G930V, SM-G930W8, SM-G9350, SM-G935F, SM-G935FD, SM-G935K, SM-G935L, SM-G935P, SM-G935S, SM-G935T, SM-G935U, SM-G935V, SM-G935W8, SM-G950U, G950U1, SM-G955U, G955U1 SM-J-series: SM-J100F, SM-J100FN, SM-J100G, SM-J100H, SM-J100M, SM-J100ML, SM-J100MU, SM-J100MV, SM-J100VPP, SM-J100Y, SM-J105B, SM-J105F, SM-J105H, SM-J105M, SM-J105Y, SM-J106B, SM-J106M, SM-J110F, SM-J110G, SM-J110H, SM-J110L, SM-J110M, SM-J111F, SM-J111M, SM-J120A, SM-J120AZ, SM-J120F, SM-J120FN, SM-J120G, SM-J120H, SM-J120M, SM-J120P, SM-J120W, SM-J120ZN, SM-J200BT, SM-J200F, SM-J200G, SM-J200GU, SM-J200H, SM-J200M, SM-J200Y, SM-J210FD, SM-J250F, SM-J250G, SM-J250M, SM-J3110, SM-J3119, SM-J320A, SM-J320AZ, SM-J320F, SM-J320FN, SM-J320G, SM-J320H, SM-J320M, SM-J320MU, SM-J320P, SM-J320W8, SM-J320ZN, SM-J321AZ, SM-J326A, SM-J326AZ, SM-J327A, SM-J327AZ, SM-J327P, SM-J327T, SM-J327T1, SM-J500F, SM-J500FN, SM-J500G, SM-J500H, SM-J500M, SM-J500NO, SM-J500Y, SM-J5108, SM-J510F, SM-J510FN, SM-J510G, SM-J510H, SM-J510K, SM-J510L, SM-J510MN, SM-J510N, SM-J510S, SM-J510U, SM-J700F, SM-J700H, SM-J700M, SM-J7108, SM-J710F, SM-J710FD, SM-J710FN, SM-J710FQ, SM-J710FZ, SM-J710GN, SM-J710K, SM-J710MN, SM-J727P, SM-J727T, SM-J727T1, SM-J727V SM-N-series: SM-N-series: SM-N750, SM-N7500Q, SM-N7502, SM-N7505, SM-N7505L, SM-N900, SM-N9000Q, SM-N9002, SM-N9005, SM-N900A, SM-N900K, SM-N900L, SM-N900P, SM-N900Q, SM-N900S, SM-N900T, SM-N900V, SM-N900W8, SM-N910A, SM-N910C, SM-N910F, SM-N910G, SM-N910H, SM-N910K, SM-N910L, SM-N910P, SM-N910S, SM-N910T, SM-N910U, SM-N910V, SM-N910W8, SM-N9150, SM-N915A, SM-N915D, SM-N915F, SM-N915FY, SM-N915G, SM-N915P, SM-N915S, SM-N915T, SM-N915W8, SM-N916K, SM-N916L, SM-N916S, SM-N9200, SM-N9208, SM-N920A, SM-N920C, SM-N920CD, SM-N920F, SM-N920G, SM-N920I, SM-N920K, SM-N920L, SM-N920P, SM-N920S, SM-N920T, SM-N920W8, SM-N9300, SM-N930A, SM-N930F, SM-N930FD, SM-N930K, SM-N930L, SM-N930P, SM-N930R4, SM-N930S, SM-N930T, SM-N930U, SM-N930W8, SM-N950U, N950U1 SM-P-series: SM-P350, SM-P355, SM-P355C, SM-P355M, SM-P355Y, SM-P550, SM-P555, SM-P555C, SM-P555K, SM-P555L, SM-P555M, SM-P555S, SM-P555Y, SM-P585M, SM-P585N, SM-P585Y, SM-P601, SM-P602 , SM-P605, SM-P605M, SM-P605S, SM-P605V, SM-P607A, SM-P607T, SM-P901, SM-P902, SM-P905, SM-P905F0, SM-P905M, SM-P905V, SM-P907A, SM-P907T SM-R-series: SM-R750, SM-R750A, SM-R750B, SM-R750D, SM-R750J, SM-R750T, SM-R750W SM-T-series: SM-T111, SM-T111M, SM-T111NQ, SM-T113, SM-T116, SM-T116BU, SM-T116IR, SM-T116NQ, SM-T116NU, SM-T116NY, SM-T210, SM-T2105, SM-T211, SM-T211M, SM-T217A, SM-T230, SM-T230NT, SM-T230NU, SM-T231, SM-T232, SM-T237P, SM-T2397, SM-T239C, SM-T239M, SM-T2556, SM-T2558, SM-T255S, SM-T280, SM-T280Q, SM-T280QZ, SM-T285, SM-T285M, SM-T285YD, SM-T287, SM-T310, SM-T311, SM-T312, SM-T315, SM-T315T, SM-T320, SM-T320NU, SM-T321, SM-T321A, SM-T325, SM-T330, SM-T331, SM-T331C, SM-T332, SM-T335, SM-T335F3, SM-T335K, SM-T335L, SM-T337A, SM-T337T, SM-T350, SM-T355, SM-T355C, SM-T355Y, SM-T357T, SM-T357W, SM-T365, SM-T365FO, SM-T365M, SM-T365Y, SM-T375L, SM-T375S, SM-T377P, SM-T377T, SM-T377W, SM-T385, SM-T385C, SM-T525, SM-T530, SM-T530NU, SM-T531, SM-T532, SM-T533, SM-T535, SM-T537A, SM-T537R4, SM-T537V, SM-T550, SM-T555, SM-T555C, SM-T560, SM-T561, SM-T561M, SM-T561Y, SM-T562, SM-T580, SM-T585, SM-T585C, SM-T677A, SM-T677K, SM-T677L, SM-T677NK, SM-T677NL, SM-T705, SM-T705C, SM-T705M, SM-T705W, SM-T705Y, SM-T707A, SM-T707V, SM-T710, SM-T715, SM-T715C, SM-T715N0, SM-T715Y, SM-T719C, SM-T719Y, SM-T805, SM-T805C, SM-T805M, SM-T805Y, SM-T807A, SM-T807J, SM-T807P, SM-T807R4, SM-T807V, SM-T810, SM-T815, SM-T815C, SM-T815N0, SM-T815Y, SM-T817P, SM-T817T, SM-T817W, SM-T818A, SM-T818T, SM-T818V, SM-T818W, SM-T819C, SM-T819Y, SM-T900, SM-T905 SM-W-series: SM-W2014, SM-W2015, SM-W2017 SM-Z-series: SM-Z130H, SM-Z200F, SM-Z200M, SM-Z200Y, SM-Z300F, SM-Z300FD, SM-Z300H SoftBank-series: SoftBank 708SC, SoftBank 805SC, SoftBank SC-04D, SoftBank707SC, SoftBank940SC, SoftBankX01SC SPH-G-series: SPH-G930 SPH-L-series: SPH-L710, SPH-L720, SPH-L720T, SPH-L900 SPH-M-series: SPH-M8400 SPH-W-series: SPH-W2400, SPH-W2500, SPH-W2700, SPH-W2900, SPH-W3000, SPH-W3500, SPH-W4100, SPH-W4200, SPH-W4700, SPH-W5000, SPH-W5200, SPH-W5300, SPH-W5310, SPH-W5500, SPH-W5700, SPH-W5900, SPH-W6300, SPH-W6310, SPH-W7100, SPH-W7700, SPH-W7900, SPH-W8300, SPH-W8400, SPH-W8700, SPH-W9000, SPH-W9300, SPH-W9500 T-series: T670, T677A, T677K , T677L, T677NK, T677NL YP-G-series: YP-G70 Octoplus Box Samsung + LG + with 5 in 1 Cable Set – Package Content Octoplus Box (without JTAG & eMMC functionality) with smart-card activated for Samsung + LG+frp actived 5 in 1 cable set (mixed Samsung and LG Cables): 1.Optimus Cable 2.Samsung Micro UART C3303K (with 530K resistor) 3.LG Micro-UART Cable 4.USB Type-C Cable 5.USB A-B cable 6.frp actived 6 months (with 50 GB download limit) of FREE access to flash file download area at Boot-Loader V2.0 Depending on customers needs, we offer different types of Octoplus Box – Octoplus Box Samsung, Octoplus Box LG and Octoplus Box Samsung + LG. Choose the one that satisfies your requirements! 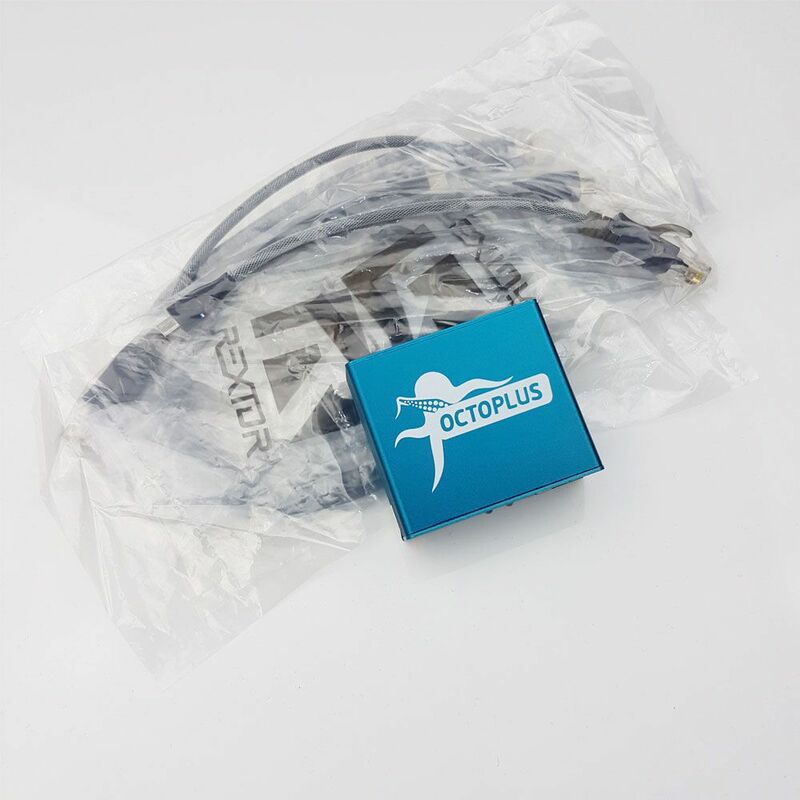 Octoplus Box Warranty 6 months Warranty period starts when Octoplus is updated for the first time. Included cables are regarded as accessories and are not covered by warranty. Due to the onrush of technology and efforts to meet market demands, we retain the right to change the list of included cables and accessories. More details are available from our sales managers.